Timesheet Troubles? 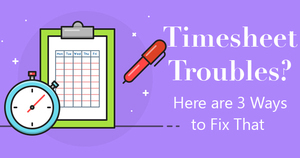 Here are 3 Ways to Fix That | TimeMachines Inc. When it comes to getting your employees paid on time, filling out timesheets can be a blessing and a curse — any number of factors can inhibit the accuracy of your employees’ timesheets, from mismatched clocks in the office to forgetful employees. Here are three ways you can improve the accuracy of your company’s timesheets. If you’re a company manager that still takes care of filling out employee timesheets, installing a payroll software that all your employees use is a necessity. By delegating the responsibility to the employee, it will encourage them to come to work on time and better manage their punches in and out. Using computer software to do this is also more beneficial than paper options — it’s not only easier to spot discrepancies on an employee’s timesheet, it’s also more accurate since it accepts the punch time associated with a network clock. Ditch your old analog wall clocks and replace your office’s entire time-keeping system with an accurate GPS network time server. Your new clock server is linked to GPS, or the Global Positioning System, which has incredibly accurate atomic clocks built into their system. A time clock server guarantees that every clock in the office has the same time and displays it accurately through both the computer itself and high quality WiFi digital wall clocks. This will not only increase the accuracy of your business’s time management, it will also clarify any discrepancies between employees and their timesheets. Say an employee clocked in at the same time as their co-worker, yet one employee looks at a clock that’s five minutes slow — though this employee worked the same amount of hours as their counterpart, one could be making more money than the other. Using a GPS network time server ensures the time management of everyone in the office is always accurate. This is one of the best ways to build trust in a company, but it doesn’t work for everyone. Of course, your employees still need to get paid for the work they do, but prescribing a set amount of hours to work in the week gives your employees the autonomy to manage their own time in a way that works for them. Though this might not be practical in a food service setting, for an office or business that relies on creative ingenuity, this can be a great way to improve a company’s culture.